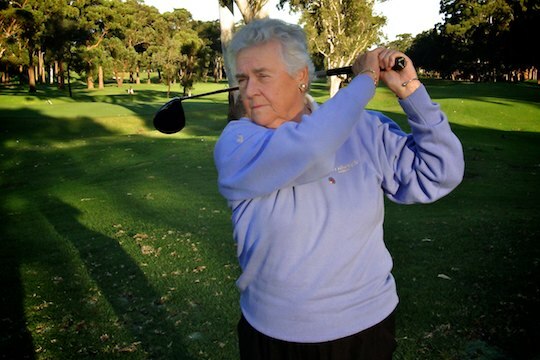 She may have just turned 80 but Australia’s first female professional golfer has no plans of slowing down. Betty Dalgleish still swings it with the best of them at her home club, Ryde-Parramatta in Sydney and has issued a friendly warning to her rivals that she is out to claim the Club Championship next month. “It’s match-play and I was always a good match-player,” Dalgleish told Golf Grinder. “That was my game, I was a better match-player than stroke player because I never used to worry. And while Dalgleish can still smack her drives up to 180m, she reluctantly admits the years have caught up with her. “I have lost a lot of distance because I don’t get the pivot and the turn and all that sort of thing now, but I still have plenty of strength,” she said. Dalgleish is one of Australian golf’s sporting legends yet her path to professional golf is a fascinating one. She took up the game at the age of 21 and soon won club championships at her home club, Royal Hobart. Tasmanian representation followed and even though she moved to Sydney, she was still selected to represent her home state until 1962. There wasn’t a title that Dalgleish didn’t win and she went on to represent NSW and her country throughout the years 1963 to 1970. Her biggest success was the Australian Amateur Championship in 1968 and such was her dominance at one stage she held five course records including a three-under 72 at the Lakes in 1964 and a two-under 71 at her beloved Ryde-Parramatta in 1965. “When they didn’t put me in the Tasman Cup Team I thought that’s it,” she said. And so Betty put amateur golf behind her. In September 1971 she became Australia’s first resident professional golfer at the ripe old age of 40. “We didn’t have anything. I was hoping a few girls would join me which they did and we gradually got a tour going about 1973,” she recalled. Betty became the first president of the Ladies Professional Golf Association (now ALPG) and its number one member – a card she still retains. Naturally she won the women’s first professional tournament, $600 out of a $3000 purse. “I remember playing Nowra because a lot of the tees were elevated and they didn’t have any grass on them and you had to hit off these corks that came out of a porphyry pearl wine bottle or something like that,” she laughed. Made a life member of the ALPG in 1983, Dalgleish has no regrets about her life but wishes she had the support that golfers receive today. “The girls have got a chance now, there was nothing then. When I first started playing golf in 1952 it wasn’t a women’s’ game. You didn’t get any help at all,” she said. Thankfully the game has changed but one thing will always remain, Betty Dalgleish’s contribution to golf and her remarkable achievements.